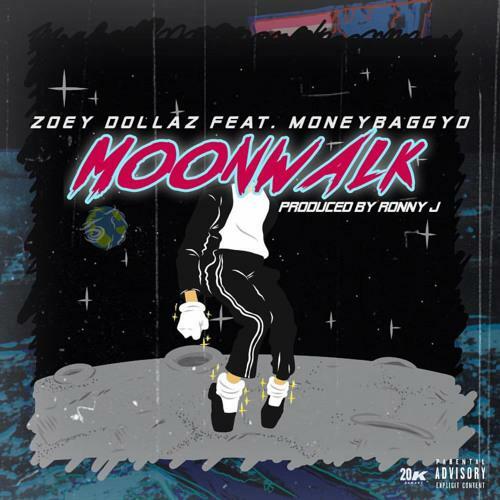 Home>New Songs>Zoey Dollaz Songs> Zoey Dollaz & Moneybagg Yo Team Up For New Song "Moon Walk"
Just hours after hitting us with the song “God Juice,” Miami’s Zoey Dollaz decides to return to the scene and share another song called “Moon Walk” featuring Moneybagg Yo. Over production from Ronny J, Zoey raps about his diamonds on his neck & wrist dancing like Mike Jackson, while showing off his rapid fire flow in the process. The song is described as “a song that make you want to dance,” but it’s unclear at the moment on where it’ll end up. Take a listen to the new collab and let us know what you think. While you’re at it, check out Zoey’s HNHH Freestyle session (below) if you missed it. SONGS Zoey Dollaz & Moneybagg Yo Team Up For New Song "Moon Walk"